MSU SPARTY MSU Sparty photo picture print at Michigan State University Spartan Stadium photo picture print photography poster for sale. MSU SPARTY MASCOT AT MSU SPARTAN STADIUM football photo picture FOR SALE -TITLE; SPARTY AND THE UofM WOLVERINE. Michigan State University MSU Spartan Stadium mascot Sparty art picture photograph print photo - Michigan State University East Lansing, Michigan art picture prints photo for sale: This Michigan State University Spartan Stadium picture photo of MSU Spartan mascot Sparty is made from an original hand-colored black and white photograph. 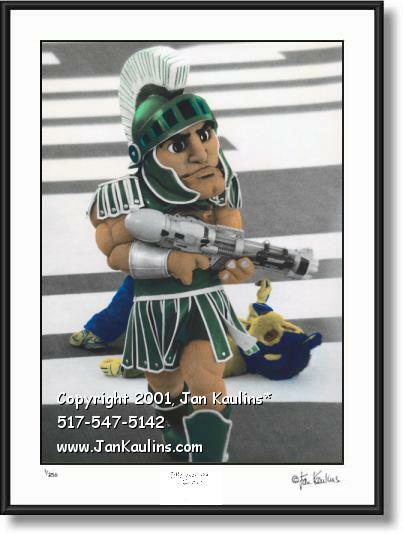 This Michigan State MSU Sparty picture photo print, taken in the end-zone of MSU Spartan Stadium, shows Michigan State University MSU mascot Sparty with a huge waterpistol having taken care of his arch-rival mascot, The U of M Wolverine, seen laying on the field in the MSU Spartan Football Stadium end zone behind Sparty. The Michigan State MSU Spartans, with their favorite mascot Sparty, won this exciting very close game on Nov. 3, 2001 with score of U of M: 24, MSU: 26. The final game winning points were put on the board with one second left to play on the clock--the MSU Spartan fans went wild! It was a big celebration for the Michigan State University MSU mascot Sparty and for the MSU Spartans, having beaten their football arch rivals The Michigan Wolverines! TO SEE THE OTHER MSU SPARTAN PHOTOS ON THIS MICHIGAN STATE UNIVERSITY SPARTAN PHOTO WEBSITE IN THE MSU PHOTO GALLERY CLICK ON THE 'BACK TO MSU SPARTAN PHOTO...' LINK NEAR TOP OF THIS PAGE.